I love this room. I love the colors and textures so much that it wasn’t until my third or fouth viewing that I even noticed that modern Christina over the mantle. And I loved her so much I had to contact the woman who made her, the talented Lucy Kirkman, and beg her to make me a print. Which she did. How nice was that? (Now you can get one too). You see, my aunt had a framed copy of the original over her couch and I used to just get lost looking at it. I was so curious about the girl and whether she wanted to get back to the farm or had run so hard to escape it that she’d fallen, panting, in the waving grass. I loved the scary sense of possibility it gave me, like I could be untethered from the life I knew at any moment just by wandering a ways away. I get the same chills from Christina in Void. But we were talking about color. We’re moving in a few weeks and as much as I’d love to paint my walls a soft white or pale neutral like those above, our new apartment has zero architectural charm. It needs color. 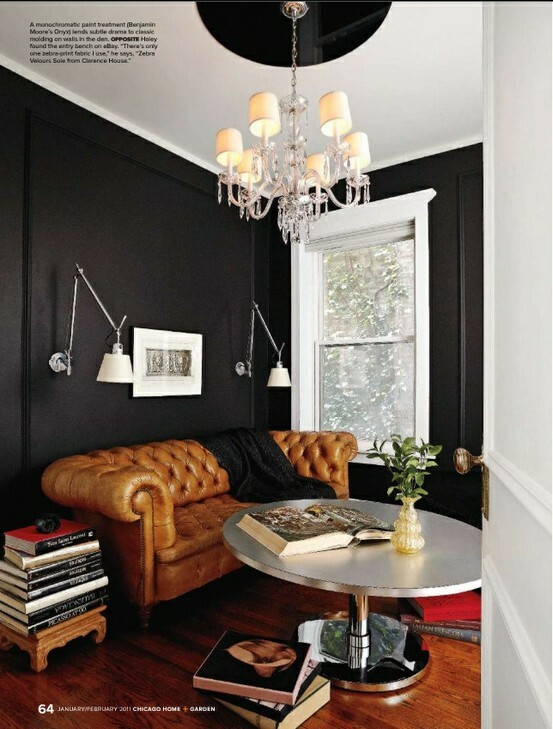 Matte black walls look elegant with bright white trim, warm wood and leather. Lamplight, books and brown velvet warm a cool blue. 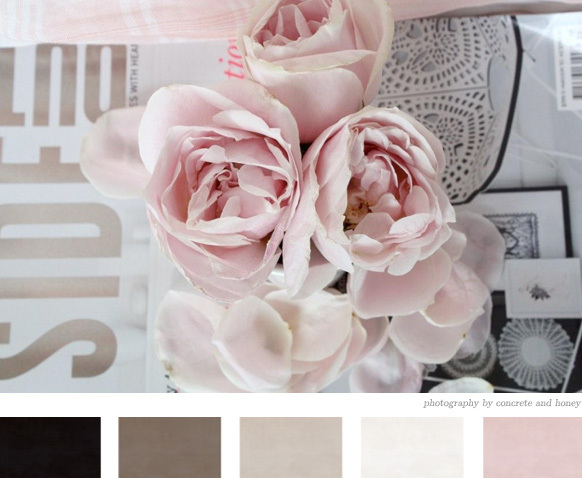 An all-time favorite palette, courtesy of the inspiring color blog Creature Comforts. Yesterday I brought home samples I may have chosen more for their names than colors: Pearlware, Wishbone, Heavy Goose, Grisailles, Stout, Black Truffle, Intaglio, Pudding Mold and Bitume, which sounds romantic but means asphalt. They are all from the discontinued Martha Stewart line that produced our current living room color, Blue Hubbard. I talked about that color here. Though Angus was taken aback when he first walked in, he is now committed to Blue Hubbard and wants to repeat it in our new place. But I want to play around a bit first. So tell me, what colors did you paint your walls? P.S. All these images are one I’ve collected on Pinterest. Are you pinning? It’s an amazing tool for curating your own personal library of likes. Request an invite here.